Opposites attract - so be prepared for the admiring glances you'll draw in this two-tone design. Bali silver rope-edge beadcaps, smooth 14k gold-filled rounds, Bali dotted edge spacers & 6mm Swarovski crystal faceted rounds in the color of your choice make this one a keeper! 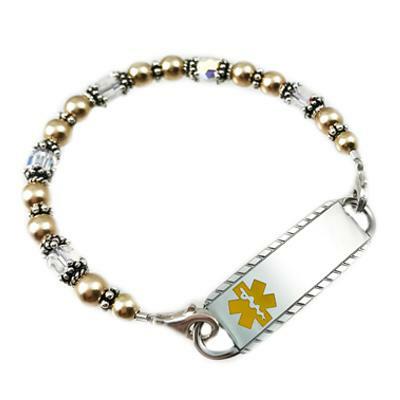 Price includes: One Elite petite stainless medical id tag with etched engraving and interchangeable beaded strand, two lobster clasps. 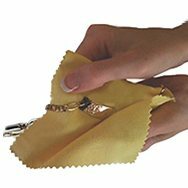 Sizing for this style: Take a snug wrist measurement, (no wiggle room) and select the bracelet size that corresponds with your wrist measurement.. Measure carefully as Creative Medical ID bracelets fit different than a regular bracelet.